2014 was the year Anselm Kiefer gave up the lead fighter jets and succumbed to the lure of gemstones. Perhaps Damien was whispering in his ear, ‘a kiss may be grand but it won’t pay the rental on your vast Parisian studio complex – diamonds are an artist’s best friend’. 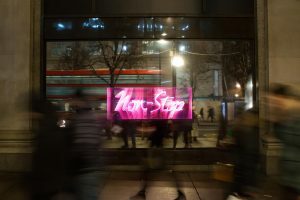 The aim of this column is to make sense of the madness in commercial art, to discover the values and ideas that inhere in it, to demonstrate that – despite the noise of contemporary spectacle – art really is just an aesthetic phenomenon which is justified in and of itself. So to end the year, here is a roundup of previously unmentioned shows which highlight certain core values of art. Miroslaw Balka: Die Traumdeutung 25,31m AMSL – White Cube Mason’s Yard: A distinctly German-looking title contains a wonderful conceit: the English ‘trauma’, Latin ‘God’ and Albanian ‘bye’ converge, along with the exact height above sea-level of Mason’s Yard, to make some hybrid of the original title of Freud’s The Interpretation of Dreams. This, combined with the promise that Balka’s work is always about the presence of the body, led us to think this was a show of weighty ideas. 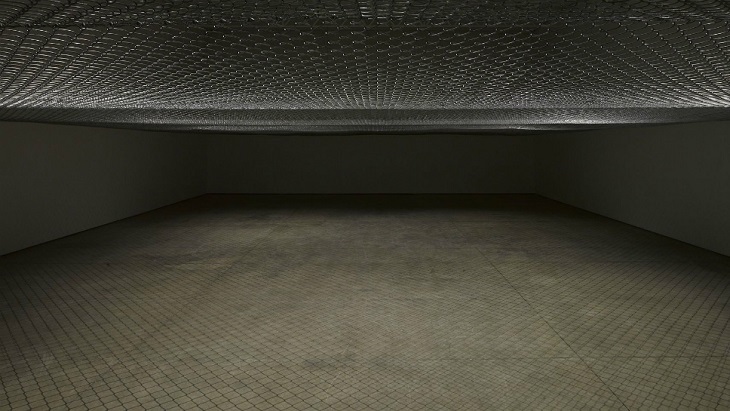 But what we actually got was some of the most physically affecting, expressive sculpture and installation of the year: Above your head (2014) was a steel mesh canopy that covered the entire ceiling of the gallery, creating a dark, claustrophobic space in which the distant sound of whistling could be heard. 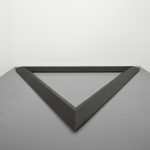 The symbolic value of this exhibition is limitless, since there can be no price for the stirring of human sentiment, which is problematic for Balka’s gallerist who nonetheless has to sell these site-specific – and yet essentially ethereal – works. Suddenly abstracted from space and time, Balka’s work makes us forget to think at all and instead expresses a sense of peril and comfort which reminds us that sometimes the purity of the aesthetic experience is all art needs to strive for. Mondrian and Colour – Turner Contemporary: The idea was simple and unpretentious; art historically and intellectually clever, but accessible. An exploration of the continuity between Mondrian’s lesser known figurative paintings and his infamous minimal grids, focusing on the simple, yet beguiling, approach to colour that characterises Mondrian’s work. 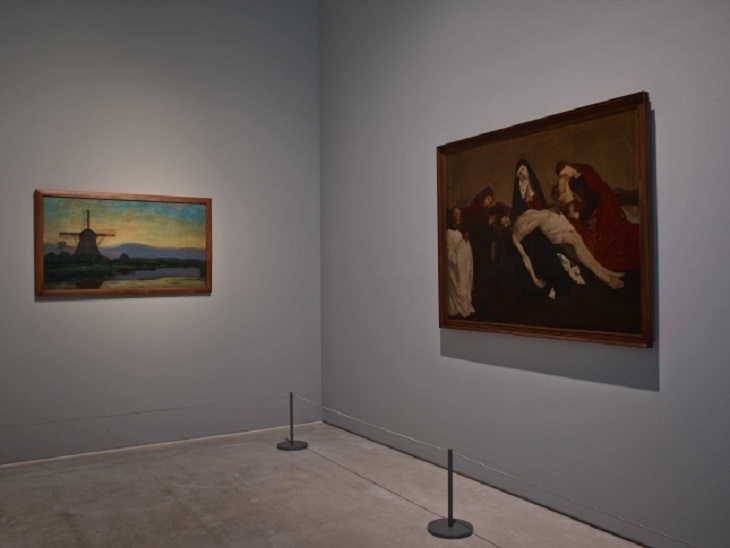 You can imagine how monumentally the Tate would have messed up such a demand for light-touch curation, but Turner Contemporary made it look effortless: it created a high-octane drama that, despite always knowing what happens at the end, had you gripped through every surprising landscape, windmill and portrait. The selection, interpretation and lighting was so refined and doggedly focused on a narrative line through colour that highlighted the hitherto overlooked brilliance of Mondrian’s early work that it was almost an anti-climax to see the grid works at the end. Most people visit galleries either lacking in or consciously unaware of the history of art, so to have it presented here in a sincere and intelligent attempt to make sense of well-known work was an invaluable contribution to the understanding, not just of Mondrian, but of modern and contemporary art. Richard Stone: gleam – Kristin Hjellegjerde: The line between painting and sculpture dissolves in the work of Richard Stone, not physically, but conceptually: the ambitions, ideas and limitations of the one are transposed into the other until the indivisible remainder is the realisation that art history is just a mythology. 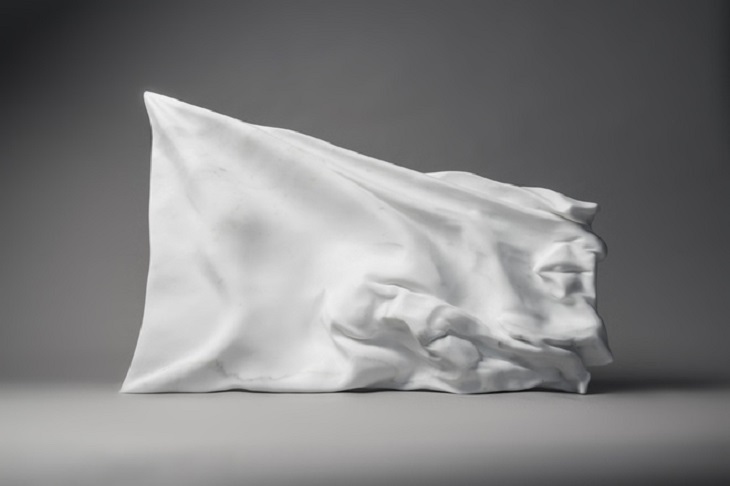 For his first solo show with Kristin Hjellegjerde, Stone presented the results of his Arts Council Research and Development award and Brian Mercer Residency at the Fonderia Artistica Mariani, Italy. 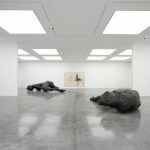 Monumental marble sculpture, bronze casts and pewter figures sat among small and large scale paintings, creating a total installation that weaved an uncertain line between romanticism and heroism. All Stone’s trademarks were here – the figures with their heads obscured, the reversal of making in painting and the fiercely intelligent deployment of contradiction – but with a renewed vigour in material sensitivity and conceptual integrity. The work looked as if it belonged in a museum at the same time as being strikingly contemporary, effortlessly demonstrating the continued relevance, if not sheer urgency, of the sublime, beauty and craftsmanship. All that glitters may not be gold, but all that gleams certainly is Stone, who is probably best described as the English Kiefer. 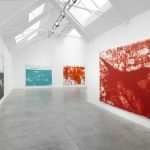 Dexter Dalwood: London Paintings – Simon Lee: Standing before Dexter Dalwood’s latest series of paintings, it seems astonishing that he did not win the Turner Prize, but absolutely imperative that he left Gagosian. Dalwood blends fiction and reality with myth and history until there is almost no way of telling them apart; the resultant paintings tell stories which take familiar events into unfamiliar territory. It’s as if we join the scene at the precise moment that space and time have vaporised, leaving an inert world of ineffable feelings to do all the narrative work. The Turner Prize cannot deal with such elegance, and Gagosian does not deserve such intelligence. These new paintings depict a London that is in equal measure dreamy and ghostly, in the moment just before or just after an everyday catastrophe; they are infused with art historical references, snatches of unseen characters and expressive to the point of morbid fascination. Just in case anyone still believes the hype, Dalwood is a lesson in why painting could never die and how the value of art lies centrally in an artist’s vision of the world. It has been an eventful year in art. Sean Penn relinquished his gun collection to Jeff Koons, Julian Schanbel made a comeback, Saatchi sold Tracey Emin’s bed, Damien Hirst asserted his authority over ideas, and James Franco tried to change the system from within. Let’s hope that next year, at the very least, we find a way to stop Miley Cyrus making a mockery of our hard work. 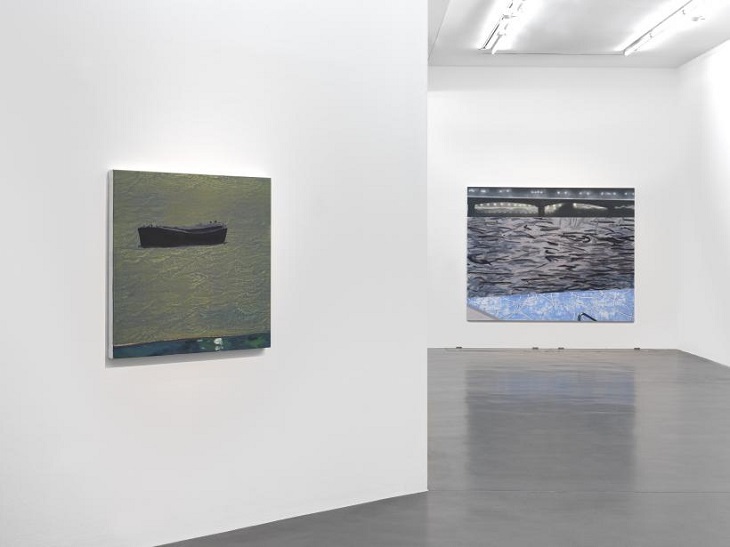 This entry was posted in NEWS and tagged Daniel Barnes, Dexter Dalwood, kristen hjellegjerde, Miroslaw Balka, Piet Mondrian, Richard Stone, Simon Lee gallery, Turner Contemporary, Value and Ideas, White Cube. Bookmark the permalink.